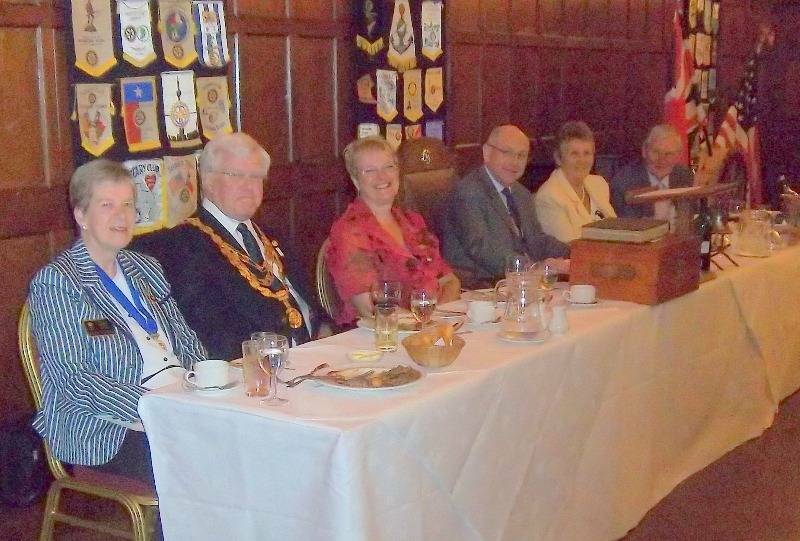 Nearly 100 Rotarians, Inner Wheel Ladies and guests attended a Dinner and Presentations at St Augustines, Westgate-on-Sea, to welcome the RIBI President John Minhinick and his wife Sheila to East Kent as part of their nationwide tour. Assistant Governor The Rev. Jan Dash said Grace which was followed by an excellent dinner. President Chris Hedges proposed the Loyal Toast and then conducted President John around the tables so that he could meet and converse with as many Rotarians as possible from the nine Clubs represented. Assistant Governor The Rev. Jan Dash read the Object of Rotary. Broadstairs ~ President Malcolm Rowlett; Dover ~ President Neil Beverton; Isle of Thanet Sunrise ~ President Rose Homewood; Margate ~ Past President Brian Homewood; Ramsgate ~ President Roger Waddell; South Foreland ~ President Peter Sherred; Thanet ~ President-Elect Neal Elliott; Whitstable ~ President-Elect Andrew Gough; Westgate & Birchington ~ President Chris Hedges; The Thanet Joint Clubs Federation ~ Chairman Chris Hedges. District Governor Stewart Grainger then formally introduced RIBI President John Minhinick who gave an inspiring speech illustrating the latest developments in the Rotary World and encouraging Rotarians and their Clubs to "blow the Rotary trumpet", recruit vigorously and maximise the influence Rotarians can exert on their local, national and international communities. At the end of his speech, President John took questions from the floor. There then followed a formal exchange of banners and President Chris gave a vote of thanks to President John and his wife for extending their tour to include the furthest extremities of East Kent and giving local Rotarians an opportunity to meet him and hear him speak.